Here's a biographical profile of Henry J. Kaiser, a great industrialist and philanthropist who had a profound impact on America's ability to prevail in World War II. People tend to regard the great American titans of the past as robber barons, men who made their fortunes off the backs of the oppressed, flaunting laws and living like nabobs while others had to scratch for a living. Some of the titans were creative and farsighted men with relatively unblemished careers who left a proud legacy of their accomplishments. Henry J. Kaiser is a prime example of such a man, a consummate salesman and visionary who built some of the world's largest dams, thousands of ships, millions of automobiles, hotels, aluminum plants, even cities, and provided his employees with health care that is known today as Kaiser Permanente, one of the nation's largest health providers. 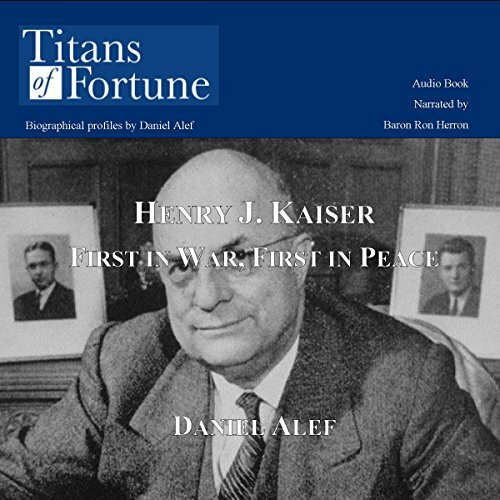 Award-winning author and syndicated columnist Daniel Alef, who has written more than 300 biographical profiles of America's greatest tycoons, brings out the story of Henry J. Kaiser and his remarkable life. What did you love best about Henry J. Kaiser? He truly was a man of industry, finding solutions where there were none apparent. What other book might you compare Henry J. Kaiser to and why? None, most other books only deal with Kaiser tangentially. His efforts in industry were instrumental to the success of the US in WWII, but little is said about the man behind the machine. It was read a little too quickly, and not much enthusiasm. Would like to know more about Henry J Kaiser.